Which mistakes will cause you to deplete your retirement savings faster? Is Your Retirement at Risk? Without knowing the status of your investment portfolio, you could be regularly losing thousands of dollars of your retirement money. Get your portfolio grade now, and keep your money in your pocket. Answer a few questions and we’ll pair you with a licensed financial advisor who will grade your portfolio from A to F.
If you get an “A”, we’ll give you $100. "My portfolio was all in one mutual fund during my initial analysis and at the time I was somewhat happy with the 4% dividend. But the Portfolio Report Card showed me the one mutual fund I owned was lacking in any significant capital appreciation and it was a front load fund with a sales charge. Since I received my final grade, I began investing in diversified areas like growth stocks, REITs, and utilities for larger dividends. My dividends have grown to an average of $2850/per month"
"Before getting graded we knew that we had problems with our retirement accounts but we couldn't put our finger on it. The Report Card helped us to uncover and fix the problem areas." "Even though I've a been pretty good saver, I've made lots of investing mistakes over the past 30 years. Having my investment assets analyzed and graded was scary at first, but the final result has been positive. I'm taking less risk and spending less in taxes and fees." "The Portfolio Report Card is easy to understand and boiled down all my investing strengths and flaws on a single page. I think both novices and experienced investors would benefit." After answering a quick questionnaire, your data is analyzed and graded by a licensed financial advisor. Your results will be hand-delivered. Simply book an appointment with the financial advisor we match you with, and that advisor will provide you with a detailed grading of your investments in person. You can go to sleep at night knowing your funds are secure. 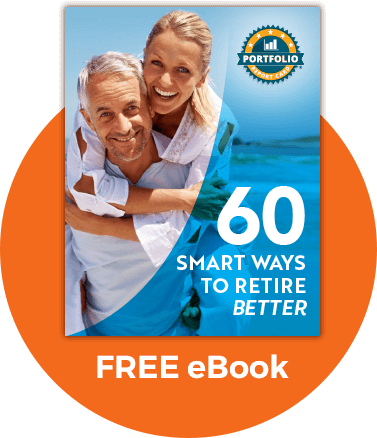 Want to be even more secure in your retirement? No matter what grade your get from you Portfolio Report Card, we’ll give you a FREE eBook when you complete the questionnaire. Where Does My Portfolio Data Go? With your privacy as our priority, we guarantee the data you provide will only be used for your own grading purposes.